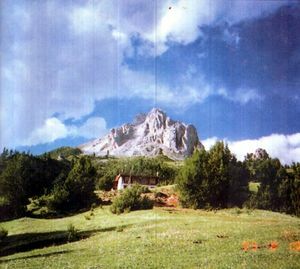 Nyala Pema Dündul (Tib. ཉག་བླ་པདྨ་བདུད་འདུལ་, Wyl. nyag bla padma bdud 'dul) (1816-1872) — the famous Dzogchen master and tertön from Nyarong who was a teacher of Tertön Sogyal and who attained the rainbow body in 1872. Nyala Pema was born in Delong Gyalnya Tang on the tenth day of the ninth month of the Fire Mouse year. His father was Khangtsek Gönpo and his mother was Sonam Kyi. His teachers included Do Khyentse Yeshe Dorje, Lama Sonam Tsultrim, Namgyal Dongak Tenzin, Trosur Kalzang Deutsen and Chöying Rangdrol. In 1860, Nyala Pema founded Kalzang Monastery. During the consecration, he had a vision of all the thousand buddhas of this aeon, the ‘Good Kalpa’ or ‘Fortunate Age’, dissolving into the site. So he named the monastery Kalzang Sangyé Chöling, “Dharma Sanctuary of the One Thousand Buddhas of the Fortunate Age”. Some say that it rained heavily all through that week, and rainbows appeared in the sky. Others said that when the seven days were coming to an end, the earth shuddered three times, the sky was streaked with rainbows and iridescent spheres of light, music was heard, and a fragrance of unearthly beauty filled the air. As they climbed the slope on the eighth day, most of the disciples must have known what they would find when they cut open their master’s tent: nothing but his hair, his nails and his clothes, still shaped around a body that was no longer there. Nyala Pema Dündul had attained the rainbow body, the supreme realization of Dzogchen, by dissolving his earthly body into light as he died. The lineage of Nyala Pema Dündul’s teachings passed to his two main disciples, Tertön Rangrik Dorje and Lama Sönam Thayé, and these were known respectively as the ‘sun’ and ‘moon’ lineages. The ‘sun’ lineage passed down eventually to Minling Trichen Rinpoche, while Lama Sönam Thayé transmitted the ‘moon’ lineage to Tertön Sogyal Lerab Lingpa, and to Sempa Dorje, the reincarnation of one of Nyala Pema’s first masters. The latter transmitted the teachings to Anyé Tulku Pema Tashi. Sempa Dorje’s reincarnation was born in 1922. This was Sherab Özer Rinpoche, who received the transmission of the Khakhyap Rangdrol and Nyala Pema Dündul’s other revelations from Anyé Tulku when he was twenty four years old, in 1946. He was also one of the main teachers of Adzom Drukpa. Yeshe Dorje. The Cloud of Nectar. Translated by Oriol Aguilar. Annotated edition edition. Arcidosso: Shang Shung Publications, 2014. Oriol Aguillar, 'Los linajes de transmisión de Nyag bla Padma bdud ‘dul', Revue d'Etudes Tibétaines, Numéro 8 – Octobre 2005, pp. 65-83. This page was last edited on 13 March 2016, at 14:30.